In July, India and Pakistan will begin a new round of talks in hopes of reviving their diplomatic efforts and renewing their peace process. While there are many pressing political issues to discuss, these talks could also be a remarkable opportunity for an innovative public diplomacy initiative between the nuclear neighbors. Although public diplomacy is often thought of as a form of state-to-state engagement, it also has the power to engage populations on a person-to-person level as well, especially in the age of social media and networking. Given the fact that many Indians and Pakistanis sing the same songs and listen to the same music, there is a unique opportunity now to promote popular music as a form of public diplomacy. Although India and Pakistan are politically divided, their cultural roots still bind them together. Nowhere is this more apparent than Punjab — a region that was partitioned to create the modern nation-states of India and Pakistan in 1947, and further divided into the Indian states of Haryana and Himachal Pradesh in the 1960s. Despite these geopolitical divisions, Punjabis in both India and Pakistan remain united by “Punjabiyat,” a shared cultural heritage that has developed over millennia. The historical Punjab is the only region in South Asia where Hindus, Muslims, and Sikhs are all represented in large numbers. Even as Punjab’s history is one of conflict and communalism, it is also one of overlapping musical and religious traditions. For example, the Guru Granth Sahib, the Sikh canonical text, contains within it not only the devotional compositions of Guru Nanak and his Sikh successors, but also verses from poets now considered Hindu and Muslim, such as Namdev and Baba Farid. Likewise, the Sikh devotional music of kirtan draws from similar lyrical sources and employs a similar instrumentation as Hindu bhajan music and Sufi qawwali music. For contemporary musicians, the devotional syncretism of Punjab remains a powerful model for how music can provide an encompassing framework for both unity and diversity. Earlier this year, I interviewed the Sufi rock star Salman Ahmad as part of a USC book launch series focused on religion, popular culture, and diplomacy. As the founder of Junoon, Pakistan’s most popular rock band, Ahmad discussed his experiences performing in both India and Pakistan and explained how rock and roll empowers and connects the youth in both countries. In the name of rock-and-roll diplomacy, Ahmad organized last year’s Concert for Pakistan at the UN General Assembly Hall as a way of raising money and awareness for the three million internally displaced people of the Swat Valley in Pakistan. Inspired by George Harrison and Ravi Shankar’s famous Concert for Bangladesh, the Concert for Pakistan brought together prominent Indian and Pakistani musicians, diplomats, and entrepreneurs in solidarity and support for Swat. Another powerful moment in India-Pakistan musical diplomacy occurred in August of 1997, when India and Pakistan celebrated their fiftieth anniversaries of independence as nation-states. In order to commemorate this occasion, the virtuoso Indian music composer A.R. 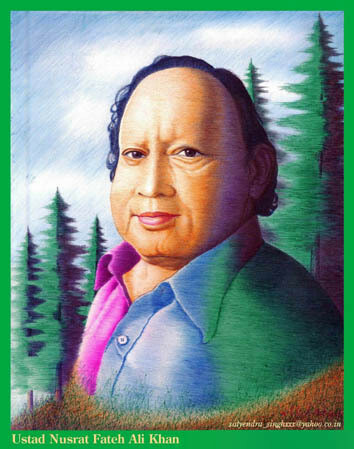 Rahman recorded with the late great Pakistani qawwali singer Nusrat Fateh Ali Khan. Together, the most famous musician from India and the most famous musician from Pakistan composed “Gurus of Peace,” an impassioned plea for peace between India and Pakistan. “Gurus of Peace” proved prescient, as the following year both India and Pakistan tested nuclear weapons, prompting President Clinton to call the India-Pakistan border the world’s most dangerous region. But A.R. Rahman and Nusrat Fateh Ali Khan had reminded the region the year earlier that India and Pakistan could unite through musical fusion instead of divide over nuclear fusion. In the 1950s, the US State Department began sponsoring jazz luminaries, such as Duke Ellington and Dizzy Gillespie, to perform concerts overseas and serve as American cultural ambassadors. This public diplomacy initiative was aimed at winning the hearts and minds of potential allies in the Cold War, but the concerts also connected communities and ideas at a person-to-person level, and inspired artistic movements throughout the world. Likewise, India and Pakistan should sponsor and promote a series of musical concerts, workshops, and exchanges as a way of creating connections and engaging communities on a non-state level. Musical diplomacy certainly has its limits and should only be one part of a broader public diplomacy strategy, but after more than 60 years of missed public diplomacy opportunities, it’s time for India and Pakistan to follow the lead of A.R. Rahman and Nusrat Fateh Ali Khan and give music a chance.